Travel to Mykonos with ferry, or airplane. 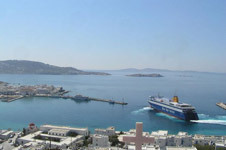 Daily from 07:00 passenger ferries and speedboats deparure from the port of Piraeus leaving for the island of Mykonos. Mykonos is some 94 nautical miles southeast of Piraeus. 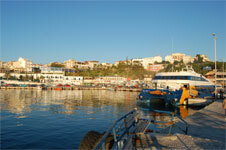 The trip with the boat is approximately 5 hours and the most usual route is: Syros-Tinos-Mykonos. The trip with a speedboat is approximately 3 hours with a variety of routes. High-speed returning late afternoon in Piraeus and departing again during the afternoon hours, 16:30-17:00. Daily from 07:15 passenger ferries and speedboats depart from the port of Rafina, for the islands of Andros, Tinos and Mykonos. The smaller fast ferries transfer only passengers and no vehicles and running two services per day during winter months. On less than 2.5 hours you can reach the old harbor on the island. Mykonos is 74 nautical miles southeast of Rafina. It can be reached by KTEl bus. Daily bus service from the Pedio of the Areos in Athens, with a private car through the Attiki Odos and heading to Markopoulo, following the exit that says, Rafina. Then drive on Marathonos Avenue until you see a sign for Rafina. 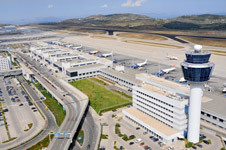 If you are at the Eleftherios Venizelos Airport you can use the buses at the airport heading to Rafina or take a taxi .The bus fee is € 3, while taxi costs about € 25 – € 30. There are two Greek airline companies which are running daily to the island of Mykonos. In the summer months the service is very regularly and Mykonos airport accepts and great number of abroad flights. Arrival at the aiprort” Eleftherios Venizelos ” is by using proastiakos train service and ATHENS METRO service. The Mykonos airport is 4 km from the Town of Mykonos and there is taxi service outside the airport. In the airport you can find car rental agencies, and information kiosk of the Association of Hoteliers Mykonos.